Jeep have released six concept vehicles for the Easter Jeep Safari later this month, and this year, they are all based on the upcoming Jeep Gladiator. First off, there’s the Wayout (ironic place to start, I know). 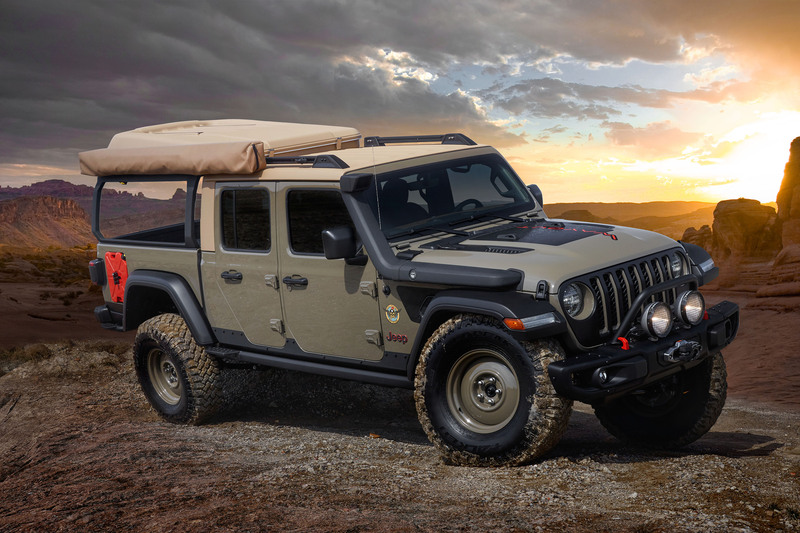 This concept places overlanding in the crosshairs, by utilising the Gladiator’s whopping payload. This is done with a custom canopy, that then has a roof tent above it. The toughened exterior features a new Gator Green paint finish, that will be available on Gladiators that roll off the production line. 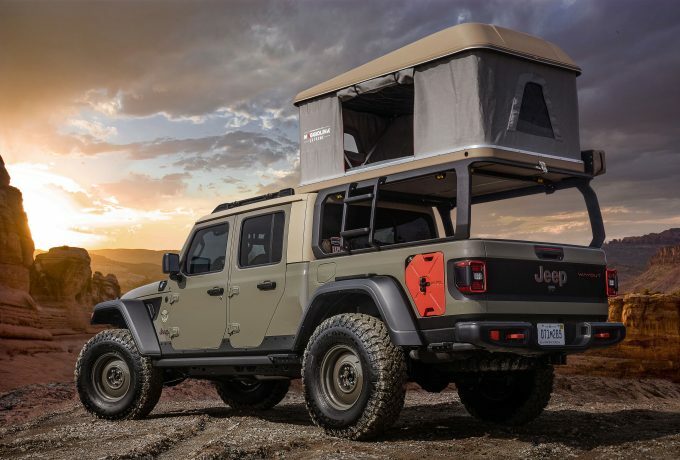 The truck bed features a custom rack with an integrated ladder and also holds the two-man roof tent and also plays mount to the 270º awning with an LED amber lighting makes setting up camp easy. 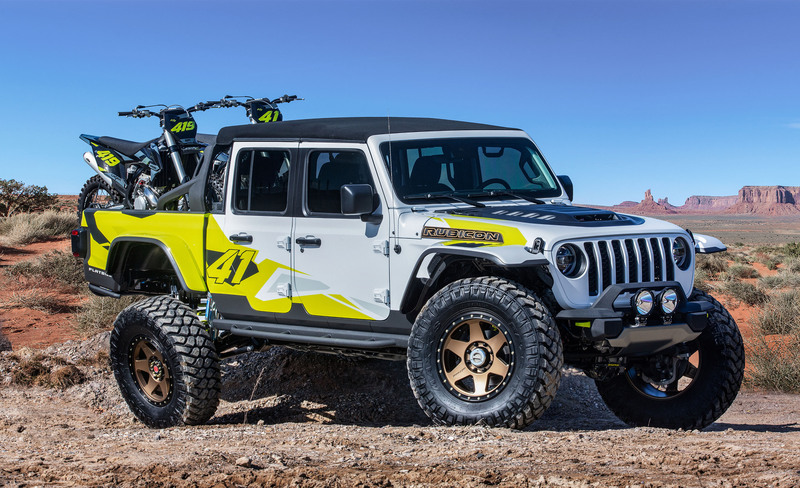 A 2″ lift has been taken from the official accessory category and it now rides on 17″ wheels dressed in 37″ mud-terrain tyres. Sitting on the front bumper is a 12,000-lb. Warn winch and the Wayout also wears a JPP snorkel. Up top there’s also an integrated roof-rack system featuring a Mopar/Decked bed-drawer system for lockable secure storage. 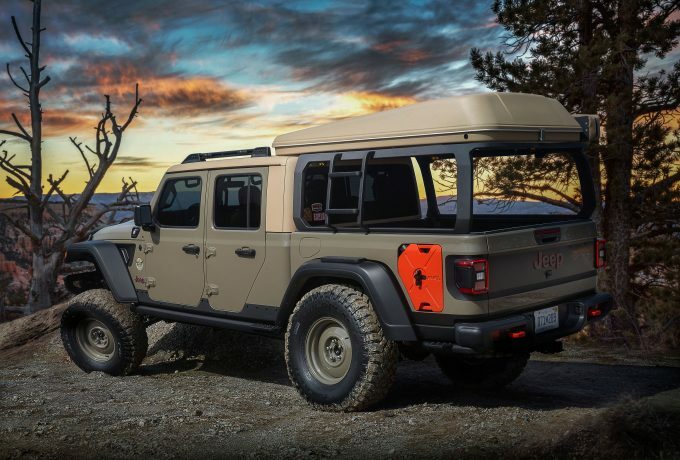 Inside, there’s bed-lined flooring plus brown trimmed leather seating, and the whole concept is powered by the revered 3.6-litre Pentastar V6 unit, with an automatic eight-speed transmission. Taking a much less sedate approach, the Flatbill is inspired, and also aimed at, the Motocross world. It’s loud and rowdy and the perfect way to transport your dirt bikes. 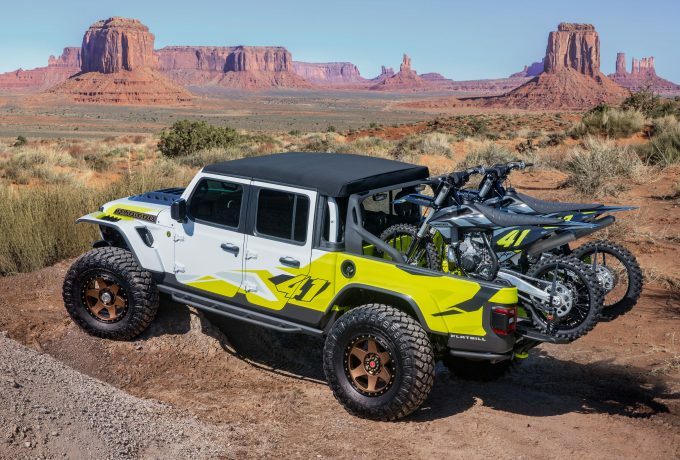 A custom set of dirt bikes sleep in the truck bed sport matching decals, and the tailgate of the truck can be removed and ramps slide out for easy access and loading of the two two-wheelers. There are Dynatrac Pro-Rock 60 axles have been fitted both front and rear, along with 20″ wheels and whopping 40″ tyres. The Flatbill too utilises the 3.6-litre Pentastar V6 and eight-speed auto, as well as a cold-air Mopar intake. Next up, the first of the heritage inspired offerings – the M-715 Five-Quarter. This restomod blends both vintage and modern components. 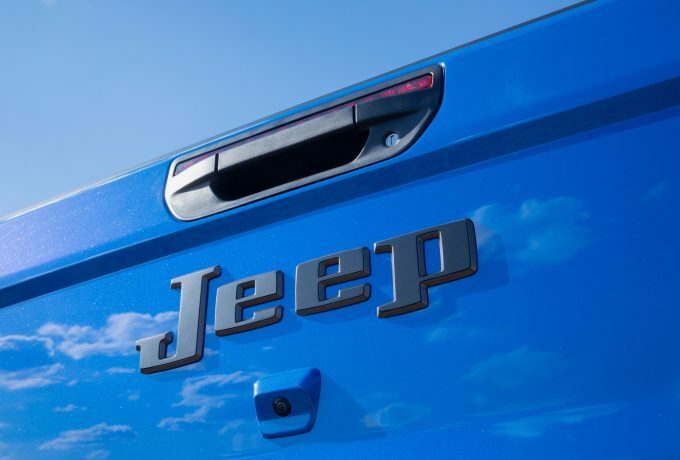 The Five-Quarter name is a nod to former Jeep trucks that were one and a quarter tonnes, aka five quarters. 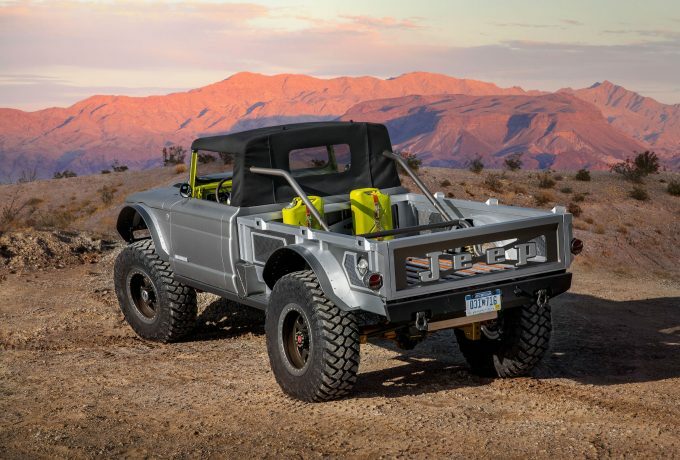 Beginning with a 1968 M-715 truck, this Gladiator-based military truck was reimagined and designed with functional improvements to the chassis, drivetrain and cargo setups. The front facia is carbon fibre, and an all-new 6-foot bespoke aluminium truck bed has been installed, combining water-cut panels and wooden slats. The instrument panel has had similar treatment, and a vintage 8-71 supercharger now encases the transmission and transfer selectors. 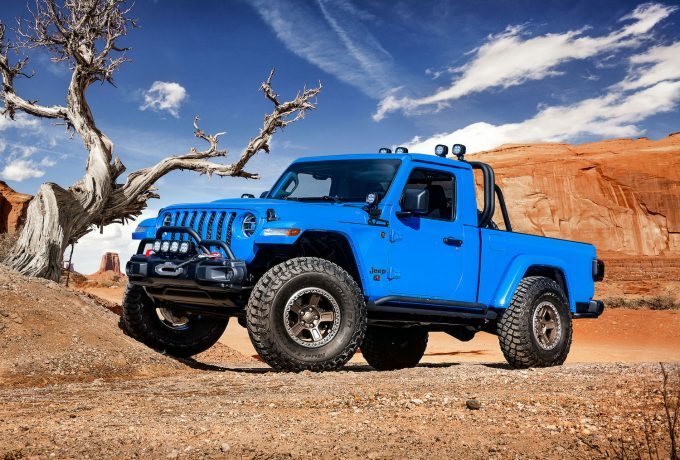 The J6 is a proper ’70s hill billy Jeep truck – and we love it. It pays homage to trucks of yesteryear with prototype and production Mopar parts. 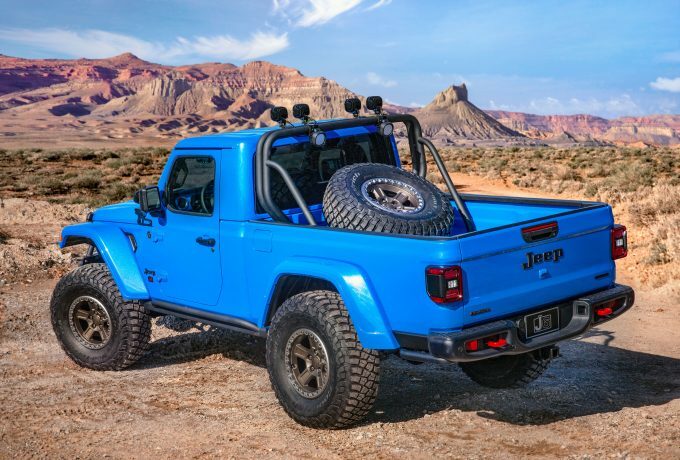 It’s a customised two-door setup, with a six-foot truck bed and painted in a wonderfully retro Brilliant Blue – a tribute to the 1978 Jeep Honcho. 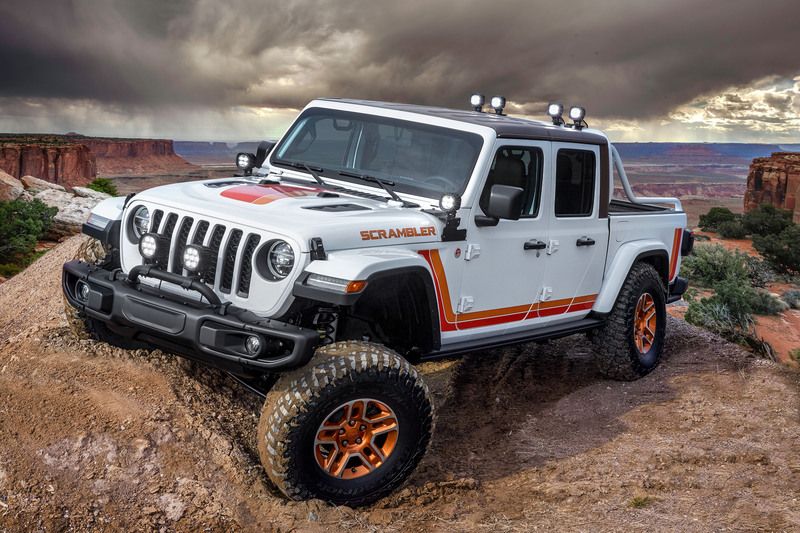 Overall, the truck measures 201″ and has a wheelbase of 118.4 – the same as the JL Wrangler four-door. 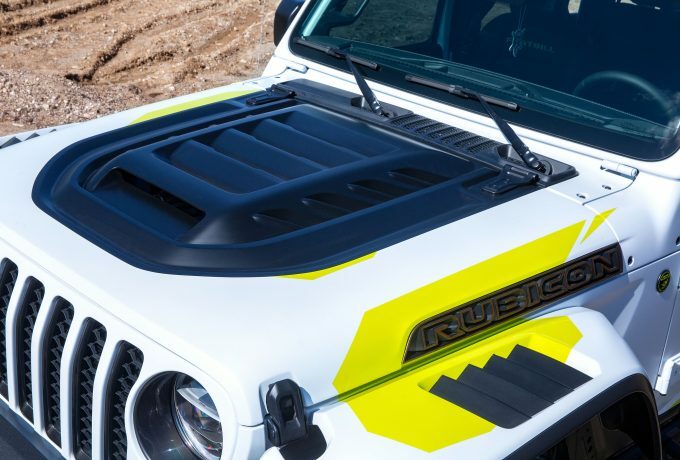 The truck bed, which is a foot longer than that on the standard Gladiator, is sprayed in a colour-matched bed liner. It also sports a custom 2.25″ steel roll bar and has a set of 5″ LED lights packing 4,800 lumens each. 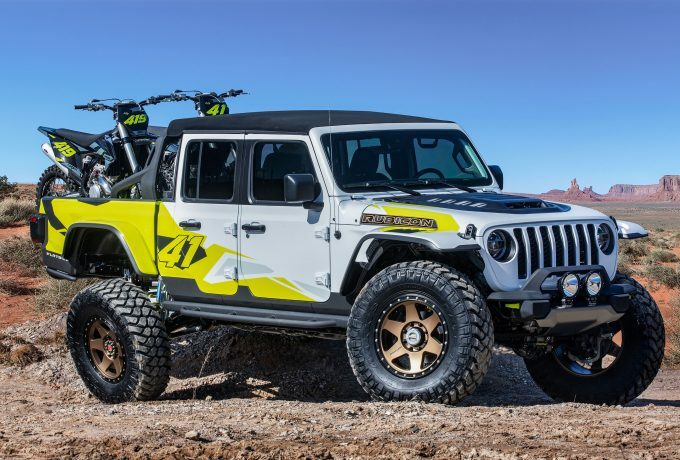 It wears 17″ beadlock wheels and utilises 37″ aggressive tyres in conjunction with a 2″ lift. Below, the J6 possesses a 2″ stinger bar on the front bumper and has rock rails of the same circumference. 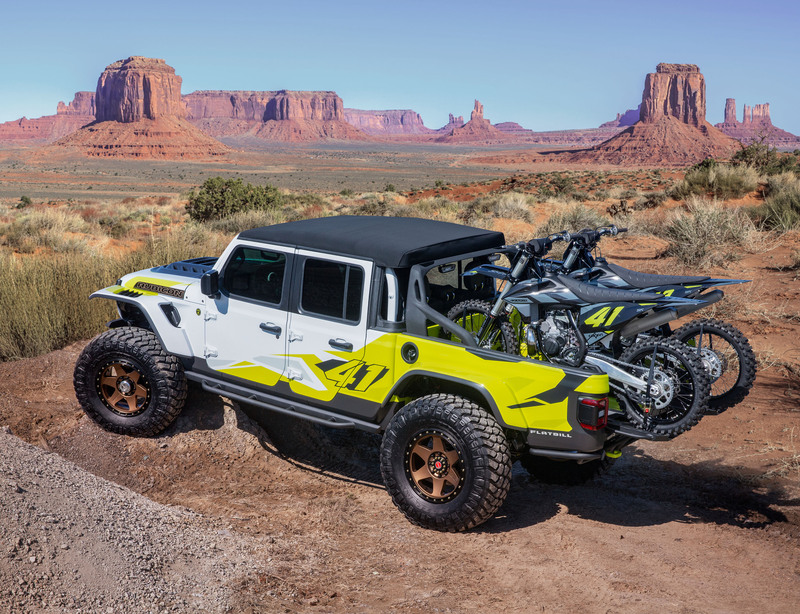 The JT Scrambler poses a mix of heritage and concept, with a retro colour scheme and graphics with numbers from the Mopar parts bin, plus some purely conceptual touches. 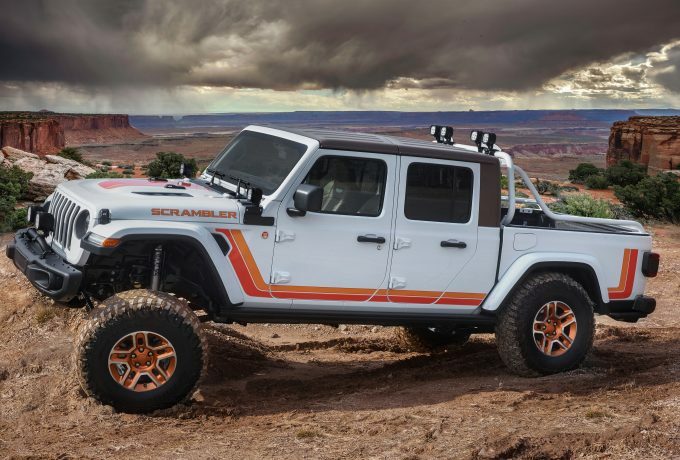 Combining the orange striping along the sides with a matching hood graphic, the JT channels the early ’80s CJ8 Scrambler. The truck bed has a custom spray liner and a 2″ prototype sport bar in body-matching white. Continuing the full length of the bed, the bars offer eight tie-down points. 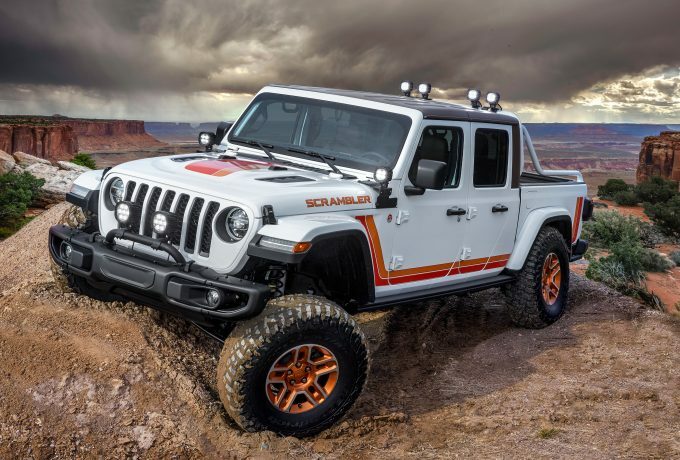 On top there are four 5″ LED lights and two more on the A-pillars, and there are two 7″ numbers mounted on the front brush guard – each with 8,000-lumens from the Mopar parts bin. It rides on 17″ wheels in a conceptual bronze hue, and it also sits 2″ taller and on 37″ tyres. The 3.6-litre V6 again makes an appearance, as does the Mopar cold-air intake and it also has a cat-back exhaust. Last but not least is the Gladiator Gravity. 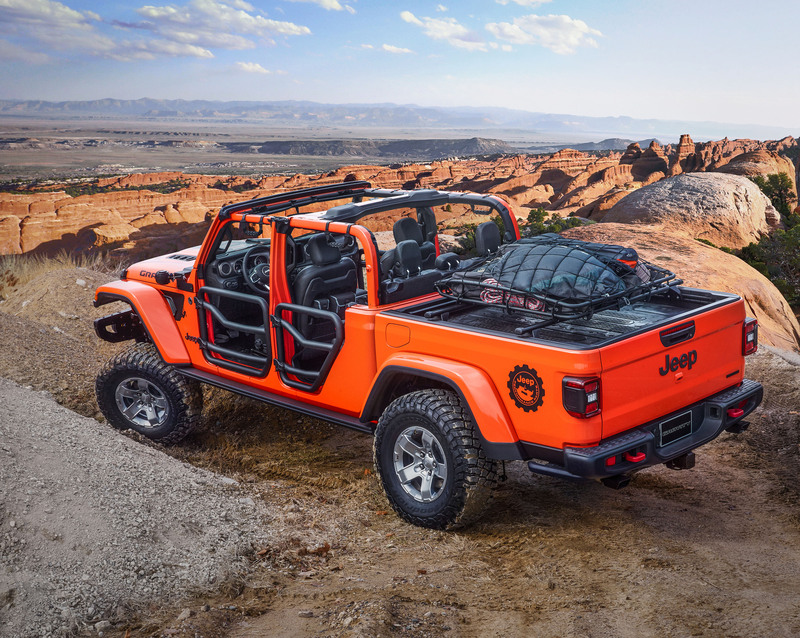 This truck is a rock-climber that utilises part available from Mopar when the Gladiator launches. 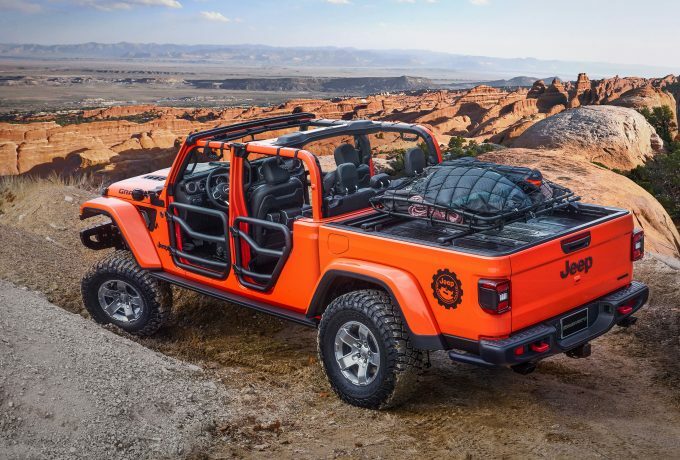 The truck bed features cross-rails and a cargo carrier basket to serve secure storage whilst rock-climbing, along with a Mopar/Decked bed storage system for lockable storage space. 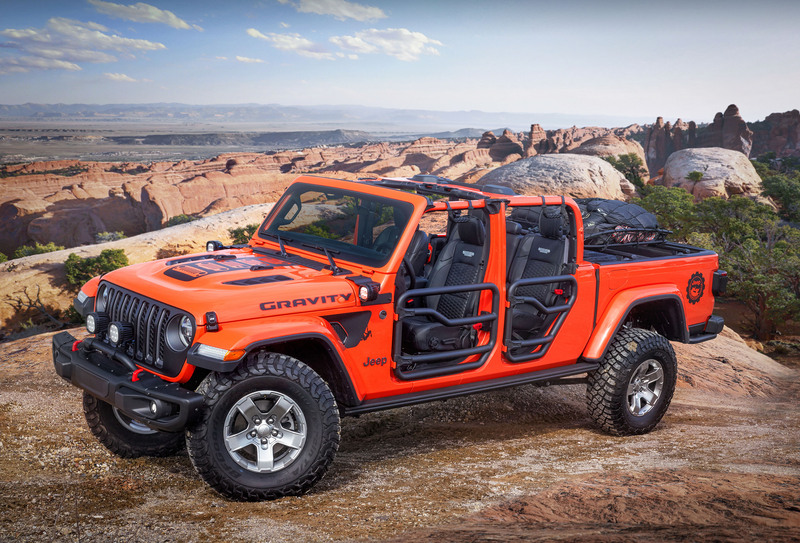 Its doors have been replaced with @’ round steel tube doors from Mopar, whilst a mesh sun-bonnet retains the open-air feel but offers sun protection. 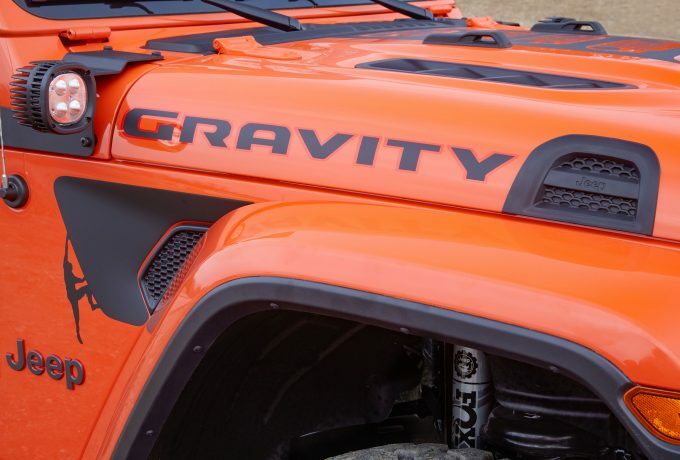 Sitting 2″ higher on the Mopar lift, the alloys fitted to the Gravity are 17″ with aggressive 35″ tyres. Heavy duty Mopar rock rails are in place to protect the chassis, and the Mopar black grille sits behind 7″ LED lights, with 5″ versions on the A-pillars. To help the engine pull, the Gravity is upgraded with a cat-back exhaust and a cold-air intake, whilst the interior is Katzkin with tungsten stitching. So now, the big question – which is your favourite?